Photo by Neal Vaidya | The ChronicleThe mock debate focused on topics such as military, no-fly zones, Syria, refugees, Islamic terrorism and North Korea. 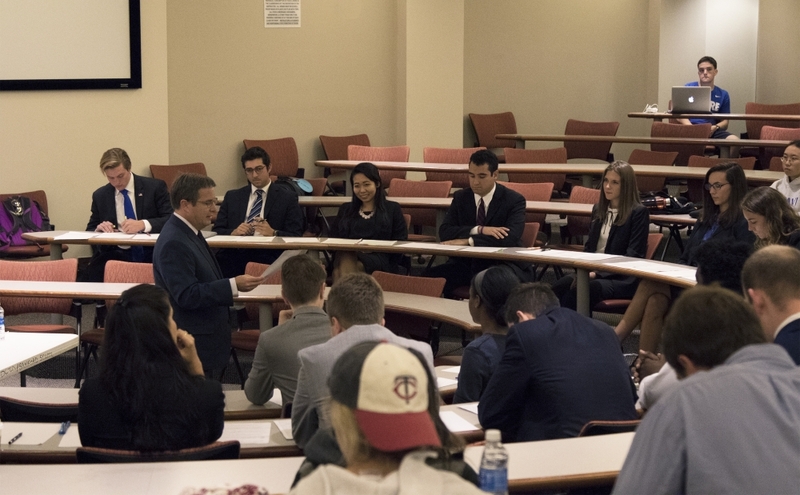 Students from a political science course engaged in a mock presidential debate Tuesday. The class—a senior seminar on security, peace and conflict—focuses on the role of foreign policy in the 2016 election. Peter Feaver, the class’s instructor and professor of political science and public policy, said that for the event, the class was split into two groups, one role-playing as campaign representatives for Democratic presidential nominee Hillary Clinton and the other for Republican presidential nominee Donald Trump. The students had to argue each side’s policies and always refer to the candidates in third-person. Feaver noted that if he was aware of a student’s political leanings, he tried to assign them to the opposite party’s team. Similarly, on the subject of North Korea, the Clinton team advocated extending sanctions, to which the Trump team countered that the existing sanctions have loopholes and subsequently called for “better alliances.” Later, the Trump team said that an influx of refugees would lead to increased ISIS presence in the United States. The Clinton camp retorted that no refugees have executed a terrorist attack since 9/11 and speculated that lone wolf attacks might be inspired by Trump’s hateful rhetoric. In a lightning round, a question was posed to both teams, and they were each given 30 seconds to answer. Though both sides agreed on several issues, they were sharply divided on the subjects of closing the Guantanamo Bay prison, detaining individuals without reading their Miranda rights and the controversy surrounding the German chancellor Angela Merkel’s phone calls. Seniors John McMichael and Chase Moyle, both members of the Trump team, said that their team began constructing their arguments at the beginning of the school year. “It was difficult trying to say a lot working with so little, coming from our side in particular,” McMichael said. Moyle noted that he and others in the class hoped to focus more on specific policy issues and express the specific positions of each candidate. Members of the Clinton team—seniors Kevin Lewallyn, Danielle Ives and John Guarco—echoed the Trump team’s sentiments about the level of preparation they felt was required for the event. “I think part of the challenge is the more you dig into these issues, the more you realize how much you don’t know,” Ives said. Students agreed that their classroom debate was more enlightening and engaging than simply watching a televised debate. “Here we actually dealt with the substantive issues of the day instead of going back-and-forth bickering and name-calling,” Guarco said. Feaver agreed with the sentiment and noted that the public nature of the event may have contributed to the students’ passion and interest. “When you know you’re going to be graded on it in a public setting with friends watching, it raises the stakes a little bit,” he said. Please enjoy these select pictures from the event!